Last week, I saw in on Erin Ireland’s Instagram Stories that she ordered a week of Planted Meals. The only two meals I remember now are peanut noodles and “beef” bourginon and with the 50% off off for first time orders, I was sold and enjoying Planted Meals this week. She also mentioned how the chocolate chip cookies are “the best” so I ordered a package of six (and shared two with in-laws). Pick up on Sundays between 5:00-7:00 pm are free. Delivery to office locations without downtown are free while delivery to home addresses start at $5. I live a five-minute drive from the commissary kitchen they operate out of and would have to pay $5 delivery… so I opted to send NPY to pick-up while out for groceries. The company seems geared to provide people with a healthy work lunch option and I would save myself from bringing a box to work every day with office delivery if my work fridge wasn’t jam-packed and it’s slightly inconsiderate to put a week’s worth of my lunches in there. I didn’t take a screenshot of the webpage where I made my meal selections where more details are provided on each meal so I only have a very concise packing slip to go by and my own observations on ingredients for the meals I enjoyed. After my experience with most of the meal prep kits I used, I appreciate the low packaging and if I told NPY to bring a reusable tote, I wouldn’t end up with a new LD reusable tote I don’t want – I think I can return it when he picks up my next order. NPY’s stance towards a plant-based diet isn’t favourable. It’s largely him being perplexed and “Why?” despite a doctor’s recommendation (applies to everyone) to reduce red meat consumption. I think it comes from not knowing and ignoring what goes into his food and not appreciating substitutions (like when I substituted yummy firm tofu and hearty chickpeas for smooth may-as-well-be-red-meat chicken thighs in a butter chicken recipe). So that it’s a one-person meal works perfectly for me, even if I try to get away with not spending close to $9 per lunch I don’t bring from home! * A not particularly equal comparison is that meal prep meals start at around $11 per person and you still have to cook it yourself. In the fridge: Sugar containers – which my co-worker says she would have fished out of the compost container and put into plastics! – with my week of lunches. Wish I could do this every week! Greek salad is not my thing at all. I usually eat only potatoes and leave the olives and abundant cucumbers behind. But it’s my lunch, so I have to eat every last vegetable: peppers first, then cucumbers, then cherry tomatoes and hearty potatoes. 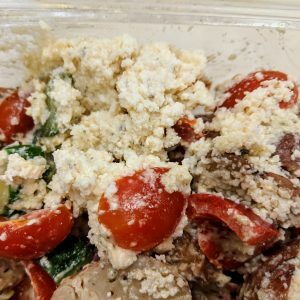 I could identify that the feta is made with tofu because of the numerous times Erin Ireland mentions making Virtuous Pie’s tofu feta recipe. It was filling despite occupying about 1/2 the container and if it wasn’t, how garlicky it left my breath made me reluctant to eat more of anything else. My first impression was that it was not very yellow mac ‘n’ cheese. In fact, it looks like macaroni salad but I know it’s not so. 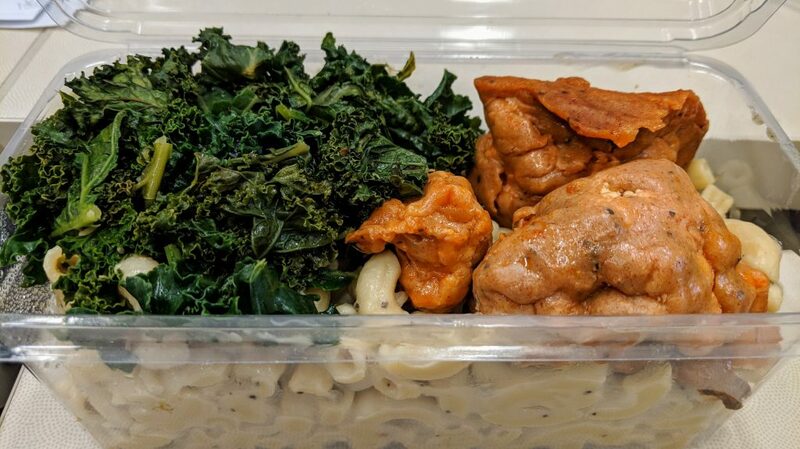 If I had read the meal plan description on line, I would not have been surprised to see Buffalo cauliflower and kale, but I was. 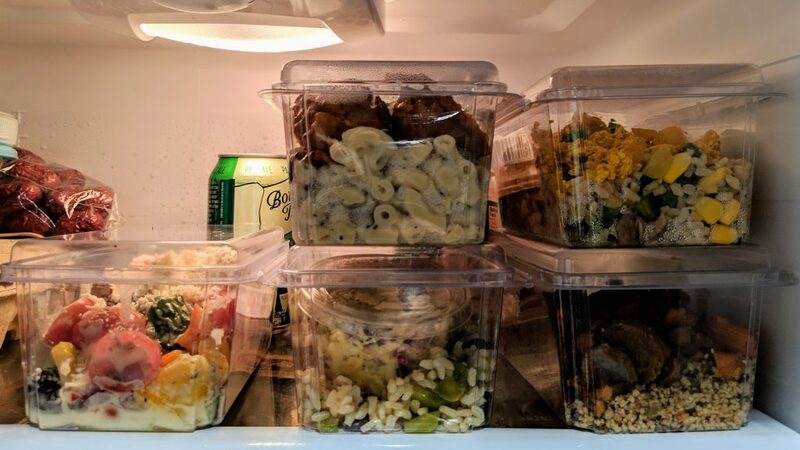 This was a good example to show my co-workers (one vegetarian, one very conscientious of what she eats) to tell them about Planted Meals for the sugar container was packed full and “mac ‘n’ cheese” sounds tasty. I kind of couldn’t wait to eat this one! It hardly tasted cheesy and while I haven’t had a lot of versions (or any?) of vegan mac ‘n’ cheese, this was not really up to stuff. Volume was super plenty – I think those sugar containers are between two and three cups in volume. Kale was lightly seasoned with salt and pepper and Buffalo cauliflower was pretty mild in flavour, insofar as Buffalo sauce can get. I don’t think the breading works unless it’s freshly fried/baked and not been in the fridge for a few days. I’ve only tried jackfruit a handful of times, if that. It was not bad in a curry from Vij’s Railway Express (food truck) and I know it’s a darling in the plant-based world for emulating shredded meat, for being “meaty”. After yesterday’s hefty and largely unsatisfying meal, I knew not to raise my hopes and further, I am not a huge fan of BBQ sauce. The coleslaw was okay, gave me pause but I assume it’s made with vegan mayonnaise. 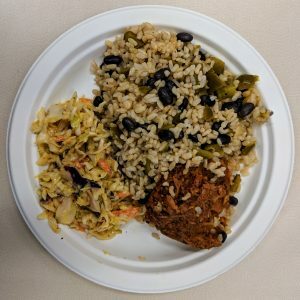 The rice is not as bad as I thought it would be – not highly seasoned but the right amount of black beans and overcooked green peppers (overcooked works just fine for me). The BBQ jackfruit surely looks like pulled pork but is softer in texture. I would have thought it was hearts of palm, artichokes or bamboo. Is jackfruit or the process of making it “pulled” expensive – the only reason I don’t think it wasn’t enough is because there was such a strong spicy kick that I couldn’t really each much more! I can’t say I was thrilled at the idea of fried rice. I freakin’ make that at home and then it looks like the frozen vegetable mix of carrots, corn, fava beans and green beans was used. Enterprising. It was a substantial amount, filling an 8″ plate and when I was pouring it out, I noticed a sharp smell. Did something go off? No, it smells like something like rice vinegar was used which is odd and offputting. The only thing that I looked forward to was the tofu because I loves tofu. It’s a wet fried rice – kind of like my attempts and there was a fairly strong taste of ginger. The tofu was okay – they used a palatable medium (firm) tofu. I knew this one wouldn’t be bad because I have lower expectations when it’s not Asian food, and even moderately executed vegan sausage is going to have lovely spices jazzing up the TVP. 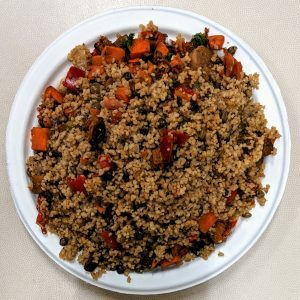 Piling the half-filled sugar container into a way-too-small paper plate, I recall why I don’t deal with couscous – that pasta goes everywhere and it’s so small you smoosh them trying to clean up. An invitation for disaster if fed to a kid. That being said, I was roundly pleased with this dish with the Middle Eastern spices and decent kick for spiciness – it felt light but will be hearty enough. 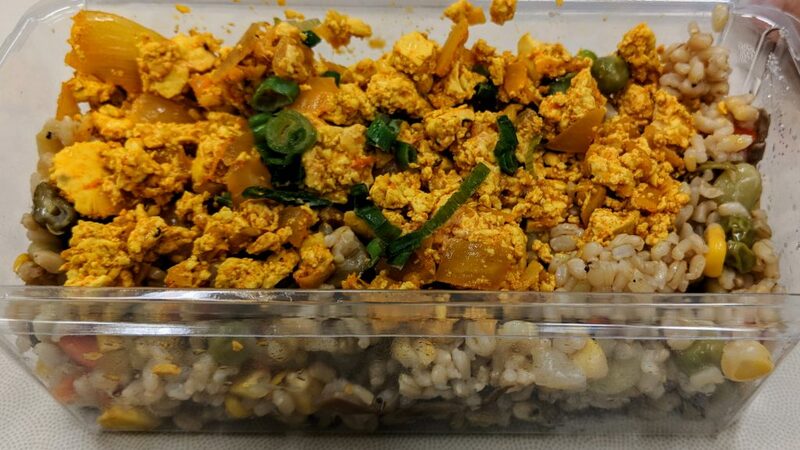 While I enjoyed three out of five meals, I liked the experience overall and will stay on the Planted Meals mailing list and make another order about a month from now. It’s a great treat and worked out so well in terms of pick-up, price, quantity and generally taste. Next time, I’ll read the descriptions more closely – thus spoiling the fun surprise that was all the toppings on the base that is advertised – and maybe make more educated selections. At the same time, I’m tempted to and hope to get to try five different meals!